Serangoon is a city that located in Singapore. Some of the notable landmarks in this city are Charlton Corner, Yeley Building and Crestar Building. Besides, there are also some shopping malls here, e.g. 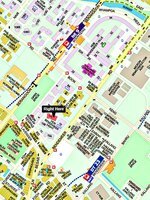 Upper Serangoon Shopping Centre, NEX, City Square Mall and The Promenade. As for universities, there are Academy Of Medicine Singapore College Of Obstetricians & Gynaecologists, Academy Of Medicine Singapore College Of Paediatrics And Child Health, Acts College, James Cook University, Singapore College Of Traditional Chinese Medicine, Singapore Of College Traditional Chinese Medicine and St Andrew's Junior College. There are also some hospitals here, such as El Shaddai Arthritis & Rheumatism Specialist Medical Centre, Finest Health Medical Centre, G I F T Medical Centre and Sata Commhealth Potong Pasir Medical Centre. Lastly, the metro transport stations here are MRT Boon Keng, MRT Kallang, MRT Potong Pasir and MRT Woodleigh.